According to the 2006/07 National Longitudinal Survey of Children and Youth, 10.8% of parents of children 6 to 9 years of age had high symptoms of depression. This was the case for the parent of 10.5% of males and 11.1% of females aged 6 to 9 years. Note:To identify the presence of parental depression, thresholds (or cutoff points) were established by taking the scale score that is closest to the 90th percentile based on Cycle 3 data for children in all provinces. The variable represents the proportion of children whose PMK exhibits higher levels of depressive symptoms and those whose PMK does not. 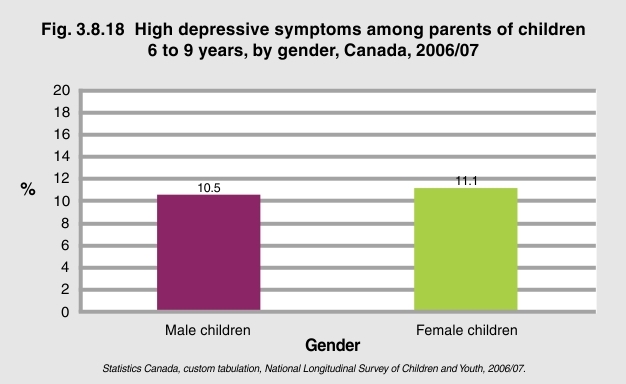 Higher PMK depressive symptoms correspond to a score of 11 or higher on the parental depression scale.